List your agency in these directories and reach qualified prospects that are serious about hiring an agency. If you run an agency, you are probably accustomed to generating most of your leads through referrals. According to HubSpot’s Agency Pricing and Financial Report, 90% of agencies rely on referrals as their top source of leads. This will always be a high percentage as long as you continue to do good work and know how to ask for a referral. However, it’s hard to control the volume of referrals you receive and referrals aren’t always in-market for your service either. In an ideal world, you’d be able to control the number of inquiries you get and you’d spend all your sales effort with highly qualified prospects. Directories provide that opportunity. If you are not already familiar, an agency directory is usually a site that allows prospective clients to research agencies on their own time, and allows marketing agencies to reach middle-of-funnel and bottom-of-funnel (or “ready-to-buy”) prospects. Software-based directories: These directories include agencies and consultants that have consistently used one piece of software to generate ROI for clients. They are associated with an agency partner program for that particular software service. Examples include HubSpot and MailChimp. Services-based directories: These directories group agencies by service offerings, like inbound marketing, content marketing and SEO. They tend to be independent businesses that generate revenue from leads sent to agencies or advertising fees. Since many directories also include reviews, client-side marketers can see which agencies look like trustworthy partners. Must include relevant information about the agency. Cannot just be a collection of links. May also include other directories. For example, ad agencies and web development firms are commonly searched alongside digital marketing agencies. Every services-based directory allows some sort of paid presence. This can include promoting your listing up to the top, receiving leads and other similar paid options. Software directories require partner program membership, which ranges from free to a fairly big commitment. 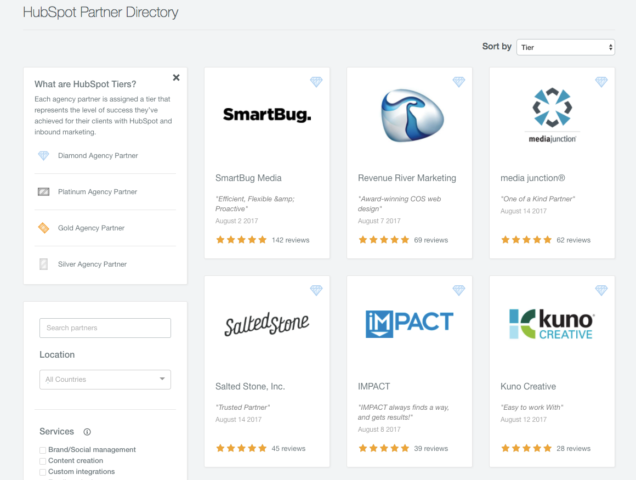 Unique focus: The Databox Partner Directory includes data-driven agencies that go out of their way to stay on top of client data. These agencies use Databox to monitor data and automatically generate reports from over 30 services. Although most members offer inbound marketing and content marketing services, it includes SEO, PPC and social ad-focused agencies as well. Free Option: Yes. Agencies can join the Partner Program with a Databox Agency Free account. The free plan allows agencies to build up to 10 templates that can be published to the directory and can also be used to automate reporting for up to 10 clients. 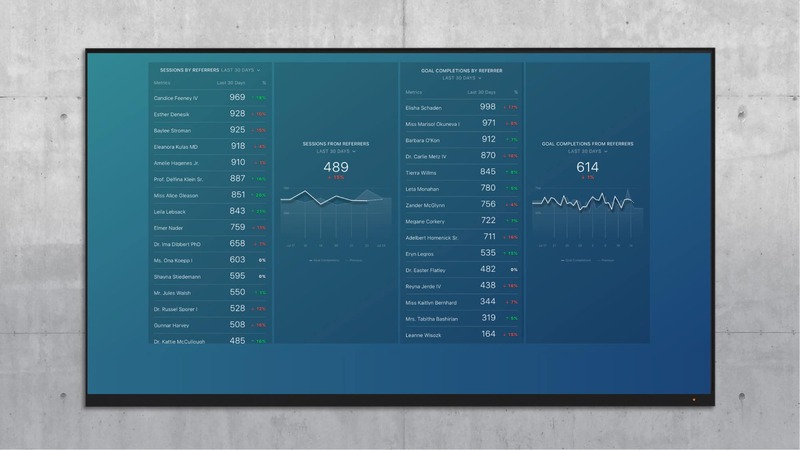 Each client can connect up to 3 datasources and have 3 dashboards too. Popularity: Over 500 leads generated for agencies via the Template Directory since launched last month. Agencies post their top dashboards for prospects to use for free and receive a lead notification when one of our other users download it. 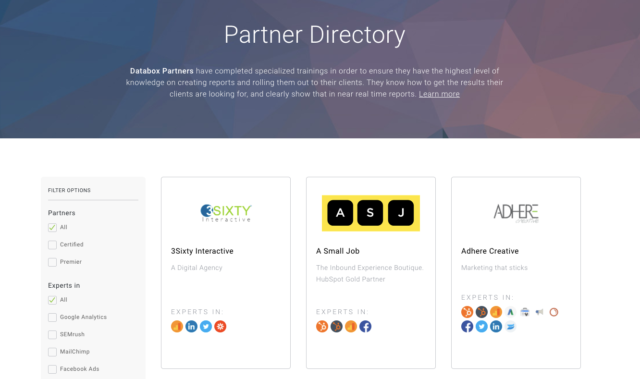 Unique focus: This directory includes tiered HubSpot Partners from the total pool of 3700+ HubSpot partner agencies. Tiered partners earn their way to Silver, Gold, Platinum or Diamond status based on a combination of inbound marketing success and amount of MRR acquired and managed. Free Option: No. You must be a tiered HubSpot partner. To be a tiered partner, you must buy the software for yourself and you also must resell HubSpot at a certain frequency. Reviews: Yes. Includes the name of client contact. Unique focus: This directory will eventually become an exhaustive resource for Facebook Ads experts. At the moment, it only includes Asian and Australian agencies. All participants have completed Facebook Blueprint, a series of lessons on best practices for Facebook’s array of paid promotional services. Free Option: Yes. Facebook Blueprint course work is free. 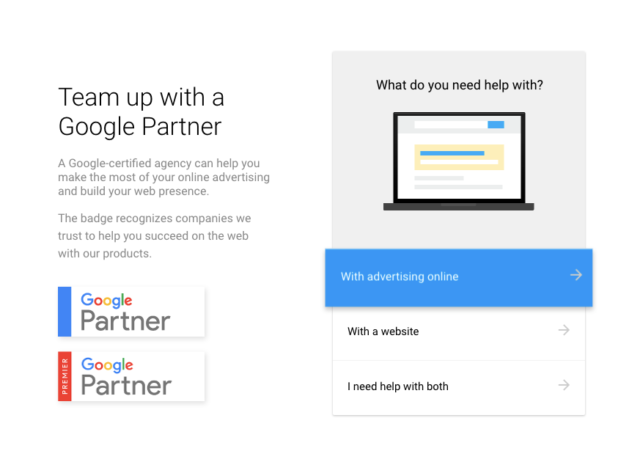 Unique focus: This directory highlights agencies and consultants that have achieved Google Partner certification for their expertise in text and video ads. It spans the suite of Google ad products, including AdWords, YouTube, AdSense, Google Shopping and Google Analytics. Free Option: Yes. No paid options. 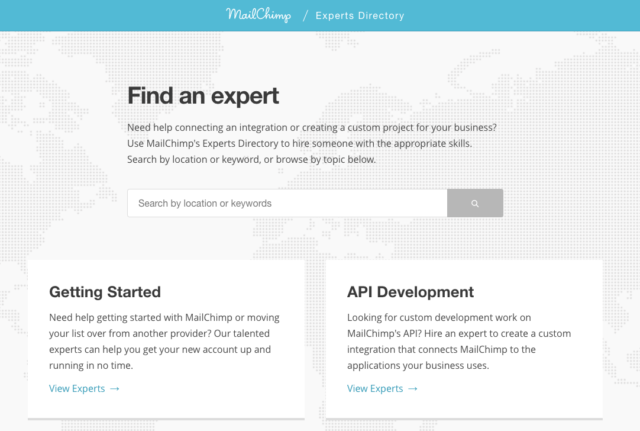 Unique focus: Members of the MailChimp Partner Program use this directory to offer their specific services around the MailChimp platform. Free Option: No. Must have paid account to get into Partner Program. Reviews: Yes. Validated via MailChimp account. 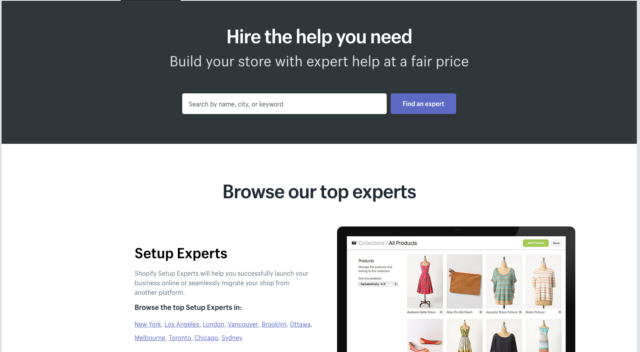 Unique focus: Members of the Shopify Partner Program who have launched 5 stores may participate in the directory. The directory includes multiple services that are needed to manage a successful Shopify store. Reviews: Yes. Validated by Shopify account. Unique focus: Agency Spotter uses concrete data – like verified client reviews – to help you find the best-fit marketing agency partners for your company. 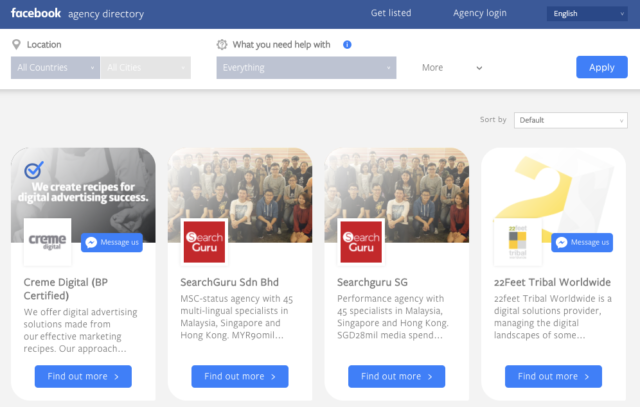 Their agency listings cover 40 marketing service areas, and searches can be filtered by criteria like budget range, agency size, industry expertise, and ownership diversity. Before being listed, all agencies go through an approval process. Free Option: Free for both agencies and in-house marketers. Agency benefits on the paid plan include a slick lead generation system, the option to list up to five searchable service areas. Paid plans also include promoted listings across agency, project, and brand-specific searches. Reviews: Yes. Each client review is verified by Agency Spotter staff and is required to be written exclusively by the agency’s clients. Unique focus: Clutch covers both marketing and software development firms. They set themselves apart through comprehensive listings. Here is an example. Reviews on Clutch are exceptional because they have a team of analysts behind the scenes that will write reviews on behalf of clients, or review posted reviews for quality. Free Option: Yes. Must have 3 client references to get listed that will later undergo review. Reviews: Yes. This is their expertise. Unique focus: Sortlist does not use a searchable directory. Instead, it has a directory of agencies on the back-end. It asks potential clients a series of questions about the services they would like. It then qualifies the prospects by phone, and charges up to 5 agencies for an intro to a qualified lead. Unique focus: DAN covers all types of digital agencies, from mobile development to branding to digital marketing. Even though it only has 400 agencies listed, it has managed to drive 80,000 monthly visitors. It also maintains job listings so agencies can recruit new team members. Categories: Categorization is based on major cities across the globe, like San Francisco, New York and London. Unique focus: UpCity helps small businesses find local marketing agencies. All search on the site is location-first. There are a maximum of 15 listings per specialty in each city. As of August 2017, they have marketplace lists in over 80 different markets, as well as national lists for top companies across the United States. Unique focus: Credo focuses on SEO agencies and consultants looking for $2-$5k retainers. This budget level is usually appropriate for SMB and startup clients. Unique focus: TopSEOs ranks SEO, PPC, and social media experts across all industries. Unique focus: Covers all types of digital agencies, including web development, branding and marketing. 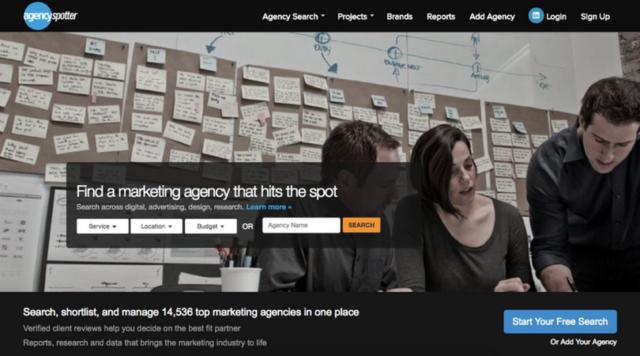 Unique focus: Rnked uses a proprietary algorithm to rank agencies by category. It operates as a brokerage service. Clients submit potential projects, and a Rnked employee will match them with an appropriate agency to begin a conversation. 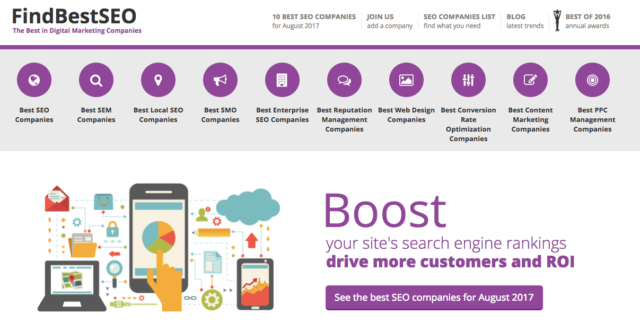 Unique focus: Although FindBestSEO includes many digital marketing categories, it mainly focuses on SEOs. It uses a proprietary scoring mechanism to rank SEO providers. 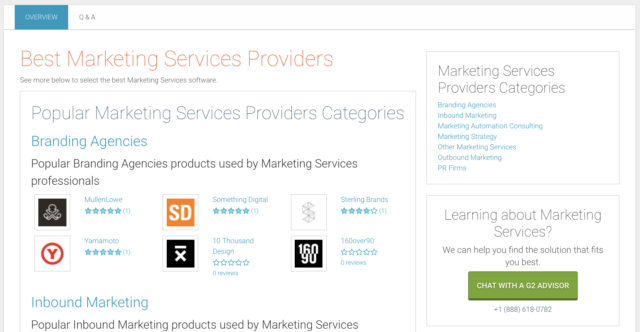 Unique focus: Although G2Crowd is traditionally known for its B2B software reviews, it actually has a strong directory for marketing services as well. It has limited profiles for free listings, and allows agencies to “claim their listing” for a fee to post client testimonials and accept leads. Reviews: Yes. Validated by Linkedin. If you begin advertising or accepting leads from one of these directories, you will want to track ROI. There is a wide variety of quality across all the options listed above, and it will be hard to immediately tell which ones fit for your agency. Some directories will only notify you of leads via an email, while others use tracking codes with your specific listing. Regardless, you can use our Referrals Overview dashboard to track your site visitors that come from directories. Since the dashboard tracks conversion metrics for referrals, you will be able to see if visitors from directories complete goals you have set up in Google Analytics. You will likely find that only a handful of directories will provide any traffic, never mind leads. Once you find a directory that provides a few quality leads, you can consider advertising or new certifications to boost your reputation. Thanks to Tim Dearlove from HubSpot for his help with this post.